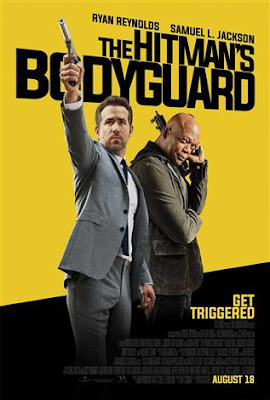 Went to see The Hitman's Bodyguard with my husband and 16 year-old daughter. We are all big action movie fans as well as fans of Reynolds and Jackson. The movie doesn't deserve all the bad press it has gotten. It is all a matter of perspective. Why are you seeing this movie? If you are going looking for an Oscar worthy performance and script...well, you are going to be disappointed. But if you love to see extravegent car chases, lots of sh** blowing up, lots of bad guys getting dead, foul language, and some sillyness to go along, then you'll love The Hitman's Bodyguard. The plot is predictable with every expected action film and enemy to friends troupes there are. Jackson and Reynolds are fun actors to watch...but the characters became them more than they became the characters...if that makes sense. Movies like these count on the chemistry between the stars and while Reynolds and Jackson were funny together I would place them at an 80% match. Now, Salma Hyek nailed her role. She wasn't in much of the movie but her scenes were hilarious. And she is so flocking beautiful! Most people will be happy seeing this at rental prices but if you appreciate all the stunts and special effects and Jackson yelling mother****** (he does it very well), then try to catch this on the big screen at a matinee. Oh good, I wanted to know if this was a fun movie and it sounds like it was. I liked the trailer and I love both actors.